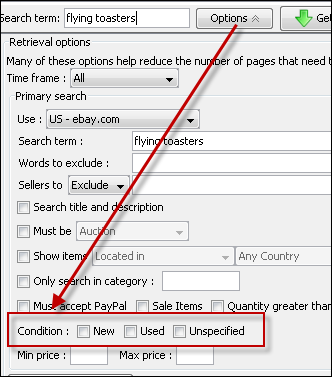 eBay changes – there were some problems, particularly when your searches contained Show items ‘Located in’ or ‘Available to’ ‘Any Country’. Note that you can select multiple conditions. So, for example, you can select both Used and Unspecified. I hope you enjoy these new features! I want to search for “For Parts or Not Working”. I know that this is not available in all categories but can we have it anyway? Can you give me an example search or category where that appears?